Preheat the grill. Place 50g softened unsalted butter in a small bowl and add the grated zest and juice of ½ lemon, 1 tsp Waitrose Cooks' Ingredients Dijon Mustard, ½ x 15g pack chives, snipped, and a pinch of cayenne pepper. Mix together until combined. Line the grill pan with foil and dot with a little of the softened butter. 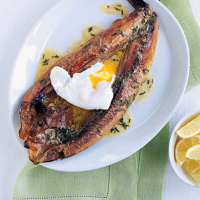 Lay 2 Craster kippers on the foil, skin-side up. Grill for 1 minute, then turn over and spread the flesh generously with the remaining butter. Grill for a further 4-5 minutes until the butter is sizzling. Serve immediately with a poached egg and extra lemon wedges to squeeze over.